Since a few days, the new Rolex Milgauss has been hitting stores (authorised dealers as well as they grey market dealers) and visitor ‘page’ on TimeZone is probably one of the first to show his! This ref.116400 Rolex features an inhouse automatic movement (caliber 3131) and measures 40mm in diameter. As big as the current sportsmodels (Submariner, Sea-Dweller, GMT, Explorer II?Ç¬etc). 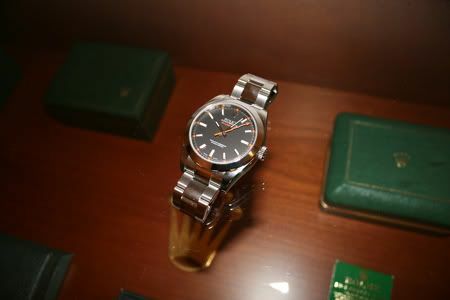 ‘Page’ also photographed his Milgauss next to the Daytona (ref.116520 or 16520). Click here for the post on the Modern Rolex forum over at TimeZone, it includes some larger pictures with more detail of the watch. Both photos taken by Page and published on TimeZone. 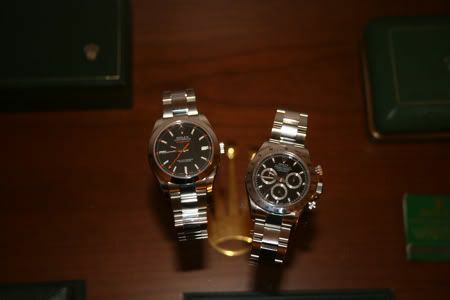 A quick search on the new Milgauss on Chrono24.com shows two models of which one is sold already..